Today, we are going to show you how you can organize your work and keep your information streamlined for quick and easy access so you never have to say “where’s that document?” ever again! We all produce and share tons of data every day. Thanks to our businesses becoming more digitally inclined, we are constantly sharing our files and documents with our co-workers via email, Slack, internal wikis, cloud files, etc. By having our documents and files at different locations, we create a digital mess that’s hard to make sense of. You can’t really get rid of these important documents containing critical information, but you can get rid of this digital mess by keeping your workplace documents organized. Documents are everywhere. Project proposals, brainstorming notes, HR guidelines, technical specs, training documents, sales decks, workplace contracts, marketing materials, blog posts- we create tons of new documents on a daily basis for proper and smooth functioning and scaling of our businesses. These documents are often scattered all over the place on our digital devices. You may have files stored in cloud apps like Dropbox, Google Drive, OneDrive, Box, files stored on your desktop, email attachments, and so on. With our content present at multiple places, how do you plan on locating, accessing, and sharing it quickly? We often don’t realize the amount of time we waste on non-value adding activities like searching for a document on our laptops or in the cloud. It is not until you have a customer on hold while you frantically search for an answer to their question or when your manager asks for an expense report from the last quarter and you just can’t the file in your email. It’s times like these that you realize the kind of digital swamp you’re living in! Browsing through hundreds of folders, searching in your disorganized and massively populated inbox, searching through your cloud files, etc., all end up being a search mission that’s impossible to crack. A global survey of workers and IT professionals in 2012 by IDC revealed that document challenges account for 21.3 percent of productivity loss. Employees often can’t find the right documents at the right time or can’t access the document due to time or location barrier. All of this add ups to a big loss of time and productivity. 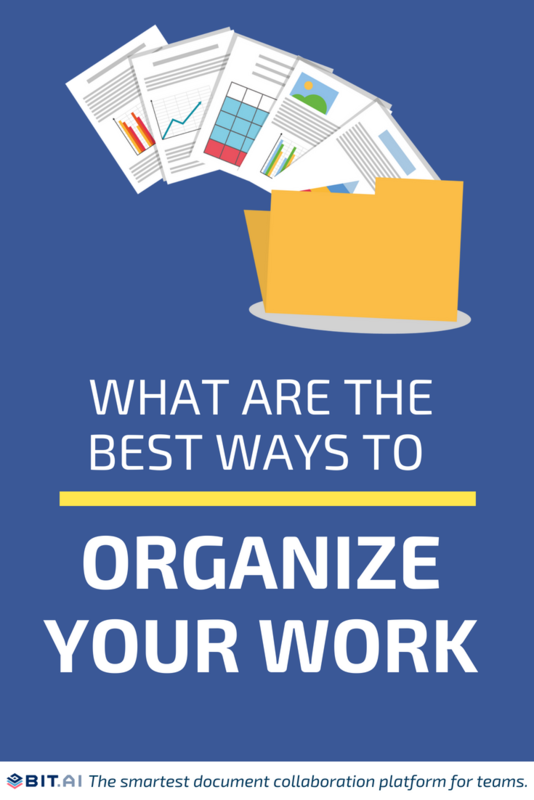 Why is organizing your work so difficult? Creating and sharing work in a digital form is supposed to be more efficient and less time consuming than traditional methods. Even though we are way past the dreaded “file cabinets” phase, digitally storing documents has emerged with its own fair share of problems and limitations. It’s been said that the Internet is forever…which is approximately how long it would take me to get this all archived in a way that both makes sense and secures these files for the future. A major problem with storing and searching for workplace documents is the fact that there are just TOO-MANY-APPS! You create your documents in Google Docs or Microsoft Word, share them via email, Slack or any other messaging service, and store them in Google Drive, Dropbox, OneDrive or some other cloud storing service. Basically, you create your files in a document editor, share them via email, get notified about the email via a messaging app, and store it in the cloud. Now let me ask you, is it really that surprising that you cannot find that file somebody emailed you last week? Don’t even get me started with those messy weblinks that float around everywhere. They come to you when you don’t need them and when you need them you can’t seem to find them! Since you don’t typically share documents with a lot of context or metadata, searching for the exact document in a sea of documents can be a pretty challenging task. According to a McKinsey report, employees spend 1.8 hours every day—9.3 hours per week, on average—searching and gathering information! Finding the right cloud service, the right desktop folder, or the right email can take hours of your crucial time. The likes of Google Docs do not allow a way to categorize documents as important or add labels to them. Even if you can pin these documents, they don’t simply appear on the top of a folder or has a special place in your document editor. Finding an important file can thus take unnecessarily long when you have content from different categories or departments under one roof. There’s no way of knowing whether you have made changes to a document after you have already shared it with your peers. You have to explicitly email them or message them about the changes and share the files again. If your document management tool lacks version control, you’re in big trouble making sense of different versions of the same document. 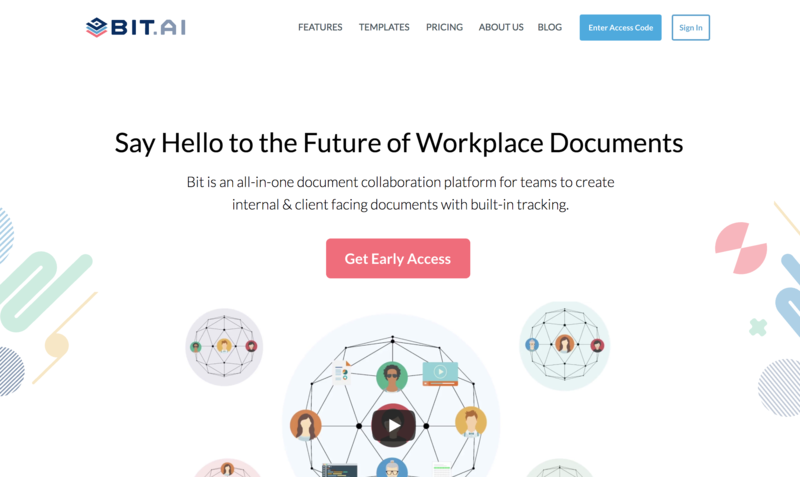 Bit.ai is a new-age document management and collaboration tool that helps teams to collaborate, share, track and manage all company documents, files, and other content in one place. Bit’s document management system allows you to create workplace documents like- project proposals, sales decks, training documents, how-to guides, company policies, process documentation, media kits, fact sheets, competitive research, case studies, e-books, etc. and provides a safe and robust place to store these documents. Multiple people can simultaneously collaborate and create a smart document in real-time. It’s a wonderful way to manage projects, create client-facing material, brainstorm, share meeting agendas, create proposals, and most importantly, share and manage information and knowledge! Bit’s smart editor makes the process of documentation and content creation quick and easy. Apart from documents, Bit also provides amazing content management capabilities. Bit has a content library that automatically saves the images, files and digital content you add to your documents (or workspaces) so that you can access and reuse them easily. Smart workspaces are created around projects, teams, departments, and clients to keep your documents, data and information organized. Workspaces make it easy to collaborate and ensure that the right team members have access to the right documents at the right time. They are fluid, so your information can move through your organization’s workflows. Bit documents also support smart search, which allows anyone to search and find any files, images, documents, and text inside documents quickly and easily across the system. With the ability to effectively label content, users can search their digital assets using keyword, titles, descriptions, or tags. They can even search files based on its source. (i.e., YouTube). This is extremely useful for new hires to not feel overwhelmed while looking for information. Bit allows users to manage permissions and information access that suits your organizational needs. It supports features like document tracking, password protection, file access restrictions, etc. that help keep your important company information safe. Bit provides you a way to organize your work in a way that facilitates flexibility and efficiency, helping you do the work you were hired to do and not just look for documents all day!